Abstract. Land management for carbon storage is discussed as being indispensable for climate change mitigation because of its large potential to remove carbon dioxide from the atmosphere, and to avoid further emissions from deforestation. However, the acceptance and feasibility of land-based mitigation projects depends on potential side effects on other important ecosystem functions and their services. Here, we use projections of future land use and land cover for different land-based mitigation options from two land-use models (IMAGE and MAgPIE) and evaluate their effects with a global dynamic vegetation model (LPJ-GUESS). In the land-use models, carbon removal was achieved either via growth of bioenergy crops combined with carbon capture and storage, via avoided deforestation and afforestation, or via a combination of both. We compare these scenarios to a reference scenario without land-based mitigation and analyse the LPJ-GUESS simulations with the aim of assessing synergies and trade-offs across a range of ecosystem service indicators: carbon storage, surface albedo, evapotranspiration, water runoff, crop production, nitrogen loss, and emissions of biogenic volatile organic compounds. In our mitigation simulations cumulative carbon storage by year 2099 ranged between 55 and 89GtC. Other ecosystem service indicators were influenced heterogeneously both positively and negatively, with large variability across regions and land-use scenarios. Avoided deforestation and afforestation led to an increase in evapotranspiration and enhanced emissions of biogenic volatile organic compounds, and to a decrease in albedo, runoff, and nitrogen loss. Crop production could also decrease in the afforestation scenarios as a result of reduced crop area, especially for MAgPIE land-use patterns, if assumed increases in crop yields cannot be realized. 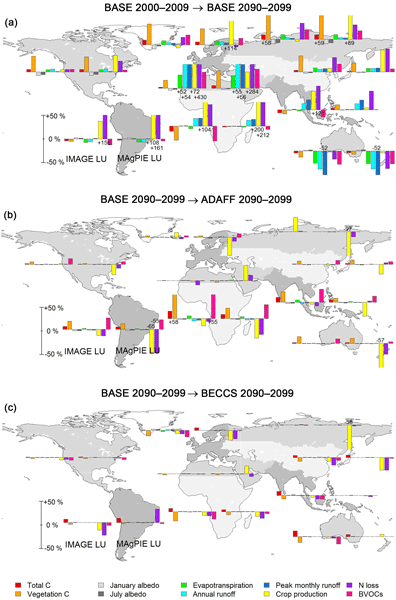 Bioenergy-based climate change mitigation was projected to affect less area globally than in the forest expansion scenarios, and resulted in less pronounced changes in most ecosystem service indicators than forest-based mitigation, but included a possible decrease in nitrogen loss, crop production, and biogenic volatile organic compounds emissions. How to cite: Krause, A., Pugh, T. A. M., Bayer, A. D., Doelman, J. C., Humpenöder, F., Anthoni, P., Olin, S., Bodirsky, B. L., Popp, A., Stehfest, E., and Arneth, A.: Global consequences of afforestation and bioenergy cultivation on ecosystem service indicators, Biogeosciences, 14, 4829-4850, https://doi.org/10.5194/bg-14-4829-2017, 2017. Many climate change mitigation scenarios require negative emissions from land management. However, environmental side effects are often not considered. Here, we use projections of future land use from two land-use models as input to a vegetation model. We show that carbon removal via bioenergy production or forest maintenance and expansion affect a range of ecosystem functions. 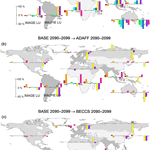 Largest impacts are found for crop production, nitrogen losses, and emissions of biogenic volatile organic compounds.